I can survive without Korean food for quite a while. But sometimes my Korean food craving hits me all of a sudden. I was hungry late last night and thinking what would be the best to fix for hunger. 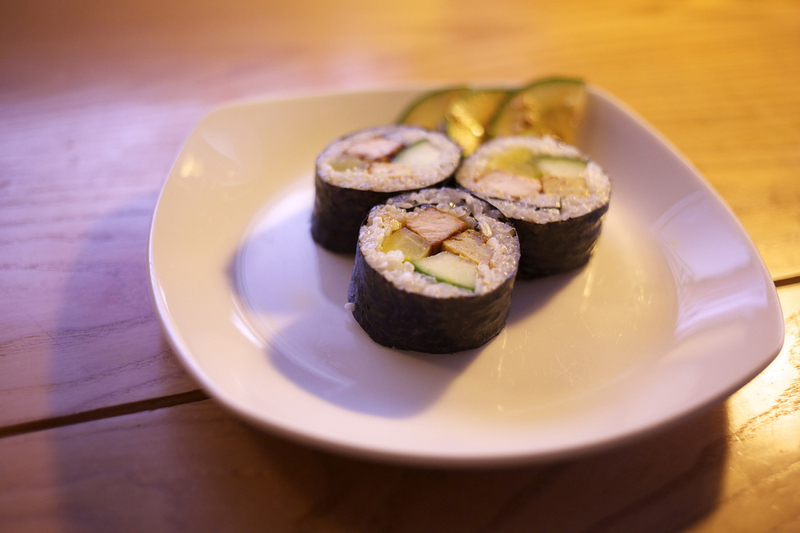 So I decided to make simple Kimbab(Korean seaweed roll). It's a Korean dish that you can easily find on a street vendor or a small restaurants in Korea and it's simple and easy finger food. It's a lot different than Japanese one. No vinegar in the rice(Korean one use salt and sesame oil for the rice seasoning) and no raw fishes. It's filled with marinated meat, pan fried eggs, radish pickle, spinach(I used cucumber instead) and some other vegetables to make the color to be stand out. Steamed rice is already in my rice cooker. So I add salt and sesame oil in the rice and mixed very well. And I only had sausages and the reddish pickles. That was simple and quick and also very delicious. So the next morning I decided to make a better one with more stuff inside. But it wasn't as good as last night. I guess I was hungry and craving that time so badly. So that made me feel the simpler one was better taste. I don't know when I will make this one again. Maybe another three months later? Let's see. Literally my May sun is disappeared. My bedroom window which is tilted along the roof line shows every details of rain drops these days. This was taken last week and it made me how much I miss sun. Weather in May is always whimsical. Morning sun doesn't guarantee the day's weather at all and your umbrella is not going to be used when you brought it out with you cause you saw rain drops in the morning. People here never carries umbrellas. They wear rain hoodie jackets. No one would know how much of rain will be there and don't wanna carry their umbrellas. So I learned from them and ignore rain all the time. But this weather brings me down. Especially we had such a long winter last year and barely had spring yet. So I took a lot of sunny days photos to cheer myself whenever I have a chance. And here they are. I know some people might say "What?" But I love Kim-chi and sometimes I try little bit of fusion food in my own way. So here I am trying to make some Kim-chi burger. Not much different than the conventional burger. But I didn't use mayonnaise and toasted the bread with olive oil. And instead of tomatoes and lettuces I use pan fired Kim-chi and onions. The result was better than my imagination. I'll have this one time to time. Ground beef with salt, pepper, chopped scallion and chilli flakes. Mix them well and make patties. Pan fry the onions and Kim-chi (add half ts of sugar). 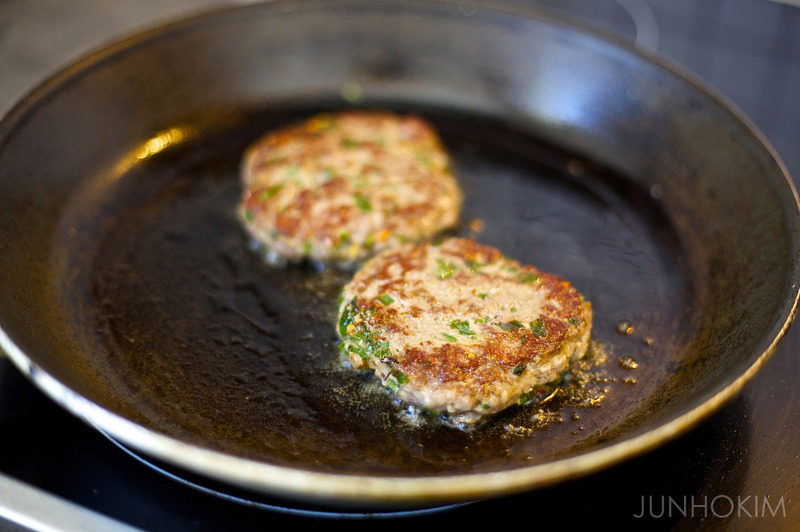 Pan fry the patties and when one side is well cooked flip them over and stack some slices of mozzarella cheese. Then everything is done and put all the ingredients and serve them. I was on my way to home from my workout and the day's sun was golden. I felt I needed my camera. So I went up to my room and took my camera to the park. Even it was short time, I was be able to enjoy how the sun was beautiful. This is one of the things that I like. Very golden color of sun lays on a meadow and it shines leaves and people's smile. 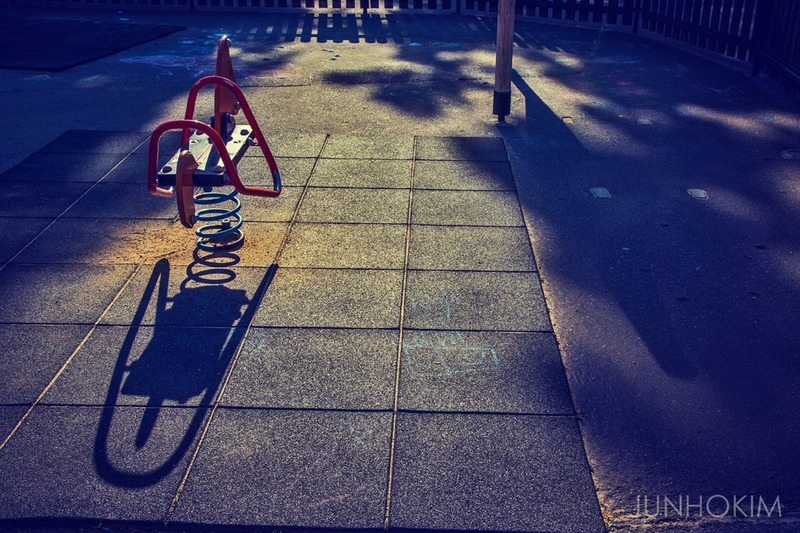 The empty kids park was so poetic. I was standing there for some times. Then I realized that I gotta do this more often. Time went so fast. 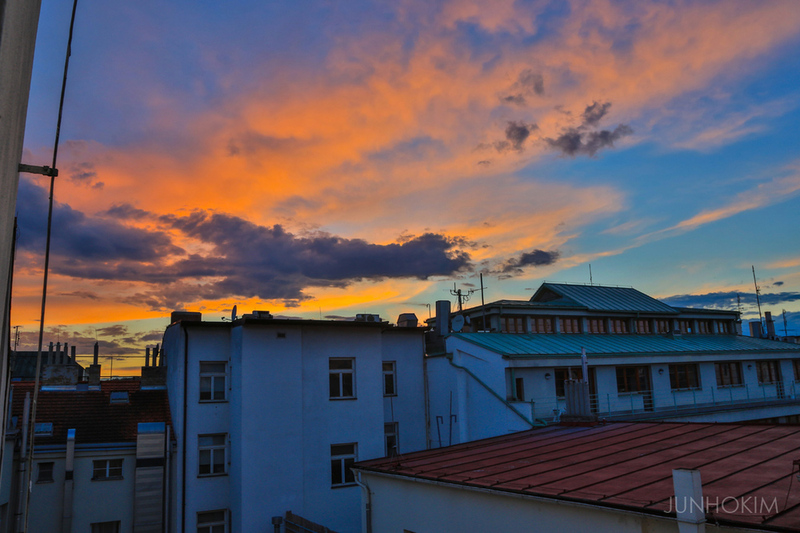 It had been already three years since I moved to Prague. First I thought "Is really going to be my home?" Now I feel it is my home. There are still some frames I didn't hang on the wall and Kitchen window glass is not yet replaced(wind slam the window and broke the glass). Well, that's my home incomplete and perfect home. I should've celebrate this day and totally forgot about it. So at least this way I want to remember the day I came to Prague and the life I had here. Thanks Prague. It is still not clear when I became an adult. The numbers we call 'age' is getting thicker and thicker. But it seems like I'm stuck in twenties except my body doesn't respond me like twenties. When we learn history, those textbooks we had are saying that from this time to that time of period is bla bla. But becoming an adult is not clear like that. I have two beautiful nieces and they are 5 and 3. They are so lovely and wonderful. They love me and still have that excitement when I get to see them. But I don't think it'll go forever. There is going to be a time that they think they are treated not fair and the whole world is not on their side. Do I know how to react or handle this kind of situations? Somehow I'm an adult. So I have to be more patience and wiser than them. But I have no idea how I can deal with it. A friend of mine who lives in London and her son is about twelve years old. Very sweet and smart kid. He is even smarter and more confident than when I was at his age. He knows way more things than me. And even acts like an adult. He is so sure at what he feels and what he wants. Compare to him, I was so child like and too shy all the time at that age. His questions are very direct. There is no mutter at his opinion. Maybe thats why? Somehow I got lost how to say to him or answer to his sharp questions. I've been in my childhood before like everybody did. So theoretically I suppose to know what to say in front of him. Cause my brain is the same one I had at his age. Why am I getting an anger even I can't show. Why am I not completely understand at his behavior even I might have been in similar situations before? And why am I not being a cool adult and making myself childish?